There is a widespread sense in the countries surveyed that China plays a more important role in the world today than it did 10 years ago. In all but two nations, half or more say that China’s power has increased. Among the seven countries asked about in the survey, Russia stands out as the only other power that is widely seen as rising in importance. While far fewer say German influence has grown, a median of 35% nonetheless say that Berlin is playing a more role important today than it was 10 years ago. Germany’s rising power is most keenly felt in Europe. People tend to evaluate the United States’ role in terms comparable to that of other countries, such as the UK, France and India, all of which are widely seen as retaining about the same importance in global affairs today as 10 years ago. Opinions do differ by region. In most of the Latin American and sub-Saharan African countries surveyed, pluralities say the U.S. is more influential than it was 10 years ago. By contrast, most Europeans see little change in Washington’s importance. In nearly all of the surveyed countries, a majority say China’s role in the world has increased over the past decade. A median of 70% say China plays a more important role in the world today than it did 10 years ago. South Koreans are most united in their evaluations of China’s power: Fully 92% say China is playing a more important role. Notably, the sense that China plays a more important role may not necessarily be seen as good in most countries; for example, only 38% of South Koreans have a favorable view of China. Among 25 countries surveyed, the prevailing view (median of 42%) is that Russia’s role in the world has grown compared with 10 years ago. Yet opinion on this count varies widely. Greeks are especially likely to say Russia’s influence has grown (65%). This view is also common in the two Middle Eastern countries surveyed – in both Israel and Tunisia, around six-in-ten or more say that Russia’s power has increased over the past decade. In the U.S., too, more than half (52%) say Russia is more important today. Across Europe, a median of 46% see Moscow playing a larger role now than it did 10 years ago. In every country polled in the region, more people say that Russia’s influence has increased over the past decade than say the same of the U.S. But nowhere is the sense of Russia’s importance more palpable than in Russia itself, where 72% say the country’s influence has grown – and this widespread sense of Russia’s growing role has increased since last year, when 59% said the same. Notably, even among countries that don’t perceive Russia’s influence to have grown, few see it as a nation that is decreasing in importance. Fewer than a third of people in any country surveyed say Russia’s power has decreased over the past 10 years. When asked about the international role played by the U.S., people in the countries polled most often say the U.S. has grown in power and influence (31%) or remained about the same (35%), compared with 10 years ago. In 2017, favorable views of the U.S. fell dramatically in many countries. Yet, even amid these changes, views of the U.S. role in the world have remained largely stable – and, in the case of some countries, even improved – since the question was last posed in 2016. In Australia, for example, favorable views of the U.S. fell from 60% in 2016 to 54% in 2018. Nonetheless, Australians today are somewhat more likely to see the U.S. playing a major global role than they were in 2016. Perceptions of America’s current role in the world differ by region, however. Across most of Europe, pluralities say the U.S. is as important as it was 10 years ago. In contrast, in many of the Latin American and sub-Saharan African countries surveyed, pluralities say the United States’ role is more important. The notable exception is Japan, the only country in which a majority of people think the U.S. is playing a less important role than it did 10 years ago. Only 16% of Japanese think Washington is playing a more important role than it did in the past, and 28% say its influence is largely the same as it was 10 years ago. In several countries – and particularly in Europe – people with higher levels of education are more likely to say the U.S. is playing a less important role than it did 10 years ago.2 In Germany, for example, only around a third of people with a secondary education or below see the U.S. in decline, while nearly half of those with a postsecondary education or more say the U.S. is losing influence. While often compared with China as an emerging superpower, India, unlike its regional neighbor, is not widely perceived as a rising force on the world stage. 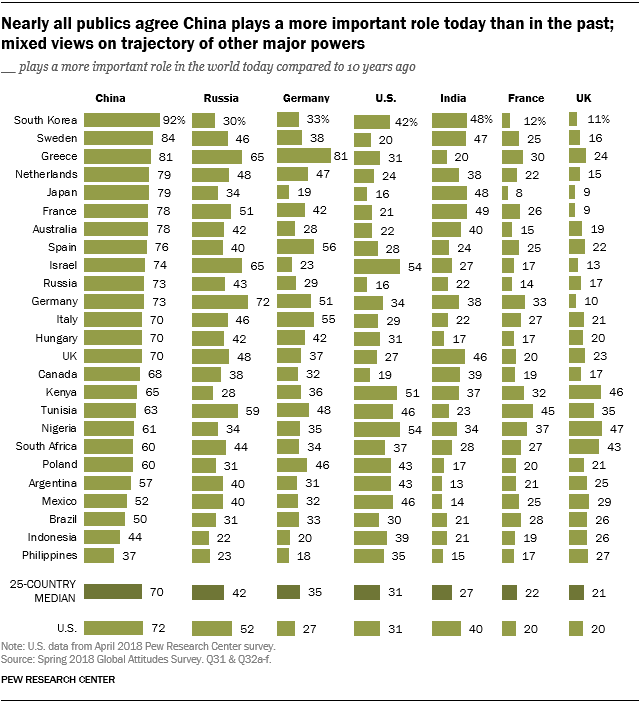 People are more likely to say India is exerting the same amount of power globally as it did 10 years ago (median of 34%) than to say that it is more important (27%). Among its regional neighbors, India’s growing importance is most strongly felt by Japanese and South Koreans (48%, respectively). Certain Western Europeans also say India’s role in the world has grown, including 49% of French, 47% of Swedes and 46% of Brits. While somewhat fewer Americans say India has gained power over the past 10 years (40%), only 17% say India has lost power, and 33% say its influence remains roughly the same as in the past. Particularly in Europe, people with higher levels of education and those who are more affluent are more likely to see India playing a larger role than it did 10 years ago.3 For example, 59% of French people with a postsecondary degree or more say India’s power has grown, compared with 40% of those with less education. Similarly, around half of Brits who have higher levels of income say India is playing a more important role, compared with 39% of those with lower incomes. Notably, few people around the globe see India as a declining power (median of 22%). Rather, more say that its influence remains roughly the same as a decade ago (34%). The only country where more than a third say that India’s global role has decreased in recent years is South Africa (37%) – a country home to a large Indian diaspora and which has long historical ties with New Delhi. Among the three European powers asked about – Germany, France and the UK – only Germany is seen by more people around the globe as a rising power rather than a status quo or declining power. A median of 35% say Germany is playing a more important role in world affairs compared with a decade ago. Just 22% think France plays more important role, while 21% say this about the UK. Among all 26 countries surveyed, France and the UK tend to be seen as status quo powers, rather than losing influence and importance. Germany’s increased influence is felt most in other European countries. Among the nine European countries surveyed, a median of 46% say Germany’s power has grown over the past 10 years. The southern European countries of Greece (81%), Spain (56%) and Italy (55%) particularly stand out for the degree to which they believe Germany’s influence has grown. This may reflect the relative economic turmoil faced by these three European Union member nations and the prominent role Germany played in negotiating bailouts and austerity measures. Germans, too, are more likely to see their country as growing in influence (51%) than as staying the same or declining. Fewer say this now than in 2016 (62%). Nevertheless, Germans are more likely to name their own country as a rising power than any other nation except China. About half of Germans (52%) believe the UK is in decline. And 39% in the UK agree that their country has lost influence over the past decade – this is more than say their country’s role has stayed about the same (36%) or grown (23%). This downbeat sentiment is echoed by most other Europeans, including 53% of Swedes, 51% of French people and 50% of the Dutch who think the UK’s role on the world stage is fading. 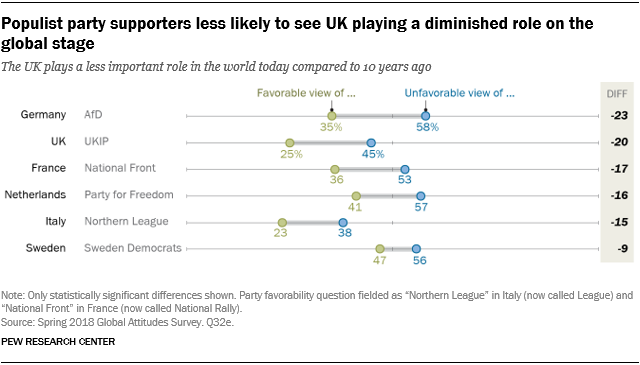 In most of these European countries, too, people with favorable views of the right-wing populist parties are less likely to see the UK declining than those who have unfavorable views of these groups. In the UK, for example, 25% of those who see UKIP in a positive light think the UK has decreased in importance, compared with 45% of those who have unfavorable opinions of UKIP. More-educated Europeans are also more likely to say that the UK’s importance has waned over the past decade. Only in the three sub-Saharan African countries surveyed – Nigeria (47%), Kenya (46%) and South Africa (43%) – do pluralities see the UK as a growing power. Compared with views towards Britain, more people see France as a status quo power than a declining or growing power. Across 25 nations polled, a median of 40% say France’s influence is largely unchanged compared with a decade ago, while 27% say it has decreased and 22% that it has increased. Among Europeans, pluralities tend to say French power is similar to 10 years ago. This includes around half or more in neighboring countries like Spain (53%) and the Netherlands (47%), as well as pluralities in Sweden (46%), Germany (44%), Italy (41%) and the UK (40%). Even among French respondents, more say France’s influence is largely unchanged (43%) than growing (26%) or shrinking (30%). This represents a modest increase in their estimations of France’s power since 2016, when more said France’s role was less important (46%) than about as important (30%).